The following diagram depicts the environment setup required for testing of an OpenStack deployment-under-test. The diagram includes the certification packages that need to be installed on each host (color coded). It is recommended to setup a test server to run OpenStack Certification tests on the system-under- test/test client. This allows testing of multiple test clients from a single test server, enables quick validation and prevents resource constraints. Install the relevant version of Red Hat OpenStack Platform (against which the certification is required) using Red Hat OpenStack Platform Product Documentation. After Red Hat OpenStack Platform is installed, read the product documentation to understand its usage and configuration. It is mandatory to use the Red Hat OpenStack Platform director for installation as it is the supported toolset for installing and managing a Red Hat OpenStack Platform environment in production. Ensure you have a private (tenant) network and private subnet in the OpenStack deployment that is under test. Create an admin tenant owned router and add the private (tenant) subnet as one of that router’s interfaces in your OpenStack deployment. Create an external (provider) network and a public subnet. Configure the external network as the above router’s gateway in your OpenStack deployment. Run the command using the Keystone command-line client. The software packages required on the OpenStack deployment-under-test/test client must be installed by subscribing to Red Hat Certification channel via CDN. This ensures that the required dependencies are automatically installed. The OpenStack deployment-under-test/test client refers to the node where the plugin/application-under-test is installed. Complete the following steps on the node where the OpenStack plugin-under-test/application-under-test is installed. Use your RHN credentials for the registration. From the list of available subscriptions, search for the subscription which provides the Red Hat Certification (for RHEL Server) repository. Make a note of the subscription and its Pool ID. The Red Hat Certification (for RHEL Server) repository provides the certification packages. Replace [pool_ID] with the Pool ID of the subscription which provides the Red Hat Certification (for RHEL Server) repository. It is mandatory to use the correct Pool ID with the # subscription-manager attach --pool command to attach the required subscription to the system. To verify the list of subscriptions your system has currently attached, at any time, run the # subscription-manager list --consumed command. Ensure that the subscription which provides the Red Hat Certification (for RHEL Server) repository is attached to your system. The OpenStack deployment-under-test (which refers to the node where the plugin/application-under-test is installed) is now prepared for certification testing. The software packages required on the test server must be installed by subscribing to Red Hat Certification channel via CDN. This ensures that the required dependencies are automatically installed. Select a persistent RHEL 7 host which can act as the test server host. The chosen RHEL 7 host should be able to access Red Hat services including the certification channels and use the same network as the OpenStack deployment-under-test (test client). The test server (RHEL 7.x host) is now prepared. 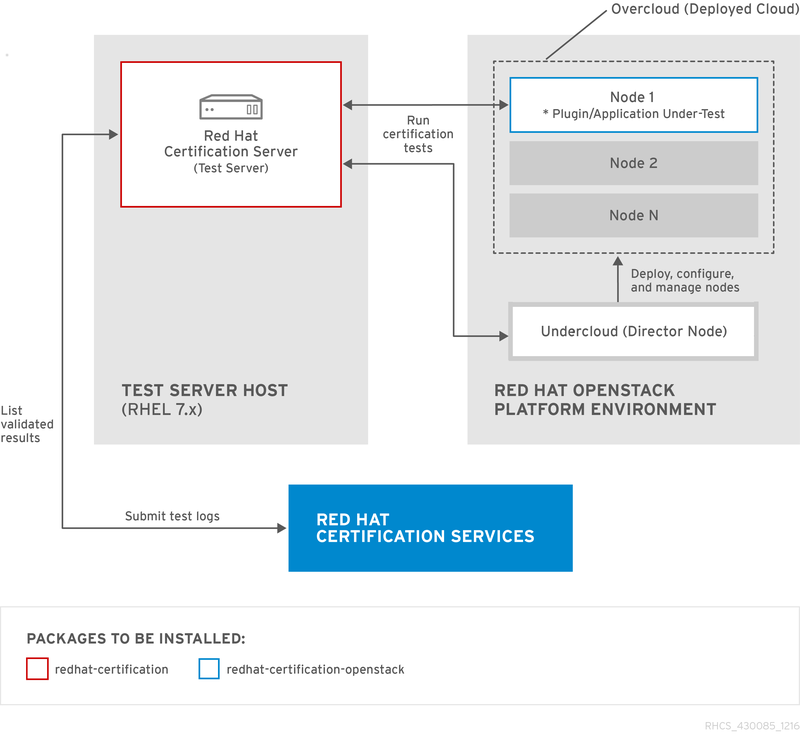 The redhat-certification package provides Red Hat Certification web UI which can be used to run certification tests on the OpenStack deployment-under-test/test client. Replace PROXY_SERVER with the IP or dns-name of your proxy server, and PROXY_PORT with your proxy port number. To open port 80 and port 8009 on test server and test client, run the rhcert-cli register command. For more information, we recommend you to refer How can we access to the Hardware Certification (rhcertd web interface) via proxy?